The US regulator is to hasten development of Novartis’ Kisqali in premenopausal women with a certain form of advanced breast cancer, potentially giving it an edge over Pfizer’s first-to-market rival, Ibrance. 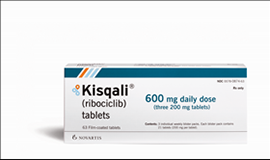 Kisqali (ribociclib) is already approved as a first-line endocrine-based therapy for postmenopausal women with hormone-receptor positive, human epidermal growth factor receptor-2 negative (HR+/HER2-) advanced or metastatic disease, with tamoxifen or an aromatase inhibitor. But the results of the phase 3 MONALEESA-7 trial suggest it could also be used in premenopausal woman with HR+/HER2- advanced or metastatic disease. The potential new indication could give an advantage over Pfizer’s rival drug from the same class, Ibrance (palbociclib), which was first to market but has yet to produce results in a major study involving premenopausal women. On the basis of the results announced at a medical conference last month, the FDA has granted Kisqali Breakthrough Therapy status, where the regulator gives extra support during clinical research and gives a faster six-month review if the drug still shows promise at the end of the development period. Breakthrough Therapy designations are reserved for drugs that improve on existing care for serious or life-threatening diseases, if the therapy has shown an improvement on available endpoint on at least one clinically significant endpoint. MONALEESA-7 assessed Kisqali, a cyclin-dependent kinase 4/6 (CDK4/6) inhibitor in premenopausal women with HR+/HER2- cancer, comparing its performance in combination with oral endocrine therapies and goserelin, with oral endocrine therapies and goserelin alone. Kisqali in combination with tamoxifen and goserelin demonstrated 22.1 months median progression-free survival compared with 11 months for tamoxifen and goserelin alone. In combination with an aromatase inhibitor and goserelin, Kisqali demonstrated 27.5 months median progression-free survival compared with 13.8 months for an aromatase inhibitor and goserelin alone. There were no new safety signals and adverse events were consistent with those observed in a study of postmenopausal women, and were managed through dose interruptions or reductions.